The Chestnuts is ideally situated just outside of brighton.This allows us to offer the best Road FREE hacking in Brighton, and Sussex. It takes around 15 minutes from Brighton Seafront to reach us by Car, assuming good traffic conditions. We're situated south bound on the A23 which is the main motorway from London to Brighton, so you've more than likely passed us if you own a car and travel. Travel by Bus/Foot/Bicycle: We don't recommend walking or cycling to the yard, unless you're over 18 and understand the risks of the route properly, as it passes very close to a busy motorway. 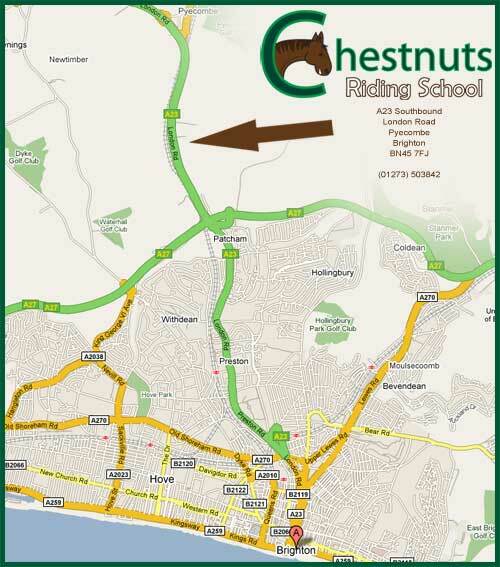 You can walk from Patcham to the Chestnuts Riding School in just under 15 minutes, it's about 2 miles. Once at the other side of the tunnel, turn right and follow the cycle path. Follow the path up a small hill, and over the railway bridge. Keep going for 2 miles up the A23 on the northbound side. You'll come to a hill which is next to the motorway underpass, a little further up is a bridge (it's an access bridge with hardly any traffic) and cross over. When you get to the other side, follow it down to a junction and turn left. About 150 yards up the road is a pub on your left, stay on the road and you'll come to a junction with traffic that heads to Burgess Hill. Cross over this and turn right back onto the Ditchling Soutbound, connecting to A23 Soundbound. Head back towards Brighton for 1.5 miles. Our main Entrance is on the Left Hand Side, pull in just before the Concrete Gates of Brighton. The Patcham 5 and 5a stops are closest to the Chestnuts, they are heavily travelled routes, and you can board them from Churchhill Square in the center of Brighton. Once again, you would be required to Walk from Patcham to the site, which is a few miles. However, it's not the recommended way of getting to the yard. But many people do it.